Enjoy a good night’s sleep when you buy a natural comforter from Satara Home & Baby! We offer an alternative selection of soft, comfy, and organic bedding at reasonable prices. You can also purchase organic pillows and mattress toppers from us. Whether you are looking for a natural comforter for a crib or king-size bed, you are sure to find what you need for your bedroom. Sleep plays a vital role in your good health and well-being. This is why Satara Home & Baby offers only the purest natural comforters, mattresses, and bedding just for you. By shopping with us, you can improve your sleep environment and get a healthful slumber when your head hits the pillow. Safe and comfortable, our bedding items are designed with your wellness and satisfaction in mind. We’ve partnered with some of the most reputable bedding manufacturers in the industry, such as Savvy Rest, Sleeptek, Coyuchi, Suite Sleep and Naturepedic, to bring you natural alternatives to traditional bedding supplies. We carefully consider who makes our products, where they’re manufactured, and what they are made of. Rest assured that every natural comforter, pillow, and mattress offered at our store is produced via certified organic or sustainable methods. In addition, no harmful chemicals and flame-retardant materials are used in making our products. At Satara Home & Baby, we also take into consideration your alternative needs and preferences. We always make sure to offer natural comforters that will fit your different sleeping habits and lifestyle. When it’s time to hit your mattress, you surely want to relax and snuggle into something delightfully cozy. Not only that, but you also want to sleep in sheets that are safe and free of potentially toxic chemicals. With a natural comforter from Satara Home & Baby, you can get all these features and more. Our natural comforters are made of wool, alpaca, or down. Made for maximum comfort, these provide a host of healthy sleep benefits that a polyester blend won’t give you. Temperature – When choosing a natural comforter, it’s important to consider how hot or cold you want to be when you go to bed. Do you like resting with many heavy layers, or do you prefer light comforters that are breathable? You should also take into account your bedroom temperature and the climate in your area. Comfort Feel – Whether you want to relax with a weighty natural comforter or something that’s light and fluffy, you’re free to choose which type you want. It all depends on your needs and preferences. Wool and Alpaca – A natural comforter consisting of wool is fluffier than silk or down. Although it can be a bit heavy, you won’t feel weighed down. Silk – If you want an airy, fluffy loft, these comforters are right for you. They have a lightweight feel and easily conform to your body. 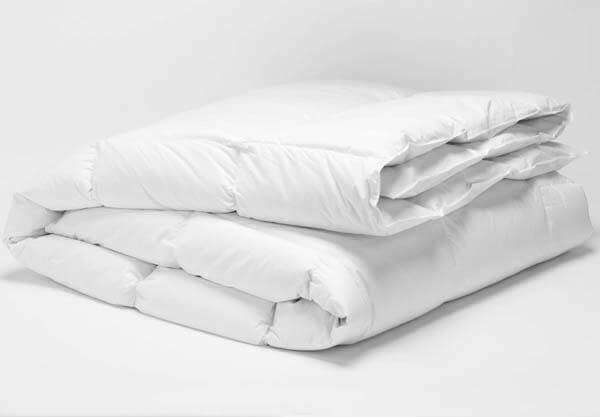 Down – Duck and goose down comforters have a fluffy loft, as well as great memory retention. They might be the puffiest of all natural comforters, but they feel incredibly lightweight. Wool – If you need extra warmth during the cold winter, a natural comforter filled with wool is perfect for you. It regulates your body temperature evenly through the night, so you won’t feel too hot or cold. Alpaca – A natural comforter filled with alpaca fiber is lighter and warmer than wool. It handles body heat and excess moisture quite well. Silk – A little warmer than wool, but not as warm as down. It diffuses body heat and moisture, making your environment dry and warm. Down – If you decide to use a down-filled natural comforter, expect the warmth of your room to build up through the night. This type of natural comforter regulates heat and moisture more slowly than the others. Design – As a buyer, you should factor in the design of the natural comforter you’re getting. Always check the cover or casing of the sheets and examine carefully if it is stitched properly. Remember that the design of each type of natural comforter may differ slightly. Protection From Allergens – Damp sheets can cause allergens to build up more quickly. If you are sensitive to dust mites, mold, and mildew, it’s best to pick a natural comforter that doesn’t hold onto moisture. We recommend that you choose comforters filled with wool or alpaca fibers. They absorb excess moisture from your body and stay dry for long. These types of natural comforters are great at naturally deterring allergens as well. Use a duvet cover to protect your comforter. This extra layer will keep your comforter safe from a blend of sweat, dust, and body oils. Wash the cover frequently to get rid of accumulated dirt. From time to time, air your comforter outside and place it under the sun. This technique will help remove bad odors, excess moisture, and contaminants. The quality of your night's rest can greatly affect your day. When you use our luxury, natural comforters from Satara Home & Baby, you are more likely to have a good night’s rest and wake up in a good mood! Visit our shop in Middleton, Wisconsin to learn more about what we offer. We will gladly welcome you to test and buy our natural comforter sets, organic pillows, and great mattress toppers!